Under the Persimmon Tree came to me via my 11-year old daughter, who read it earlier this academic year for school. She has recommended the book many times as a choice for the Rock & Roll Book Club, to which we finally acquiesced last month. 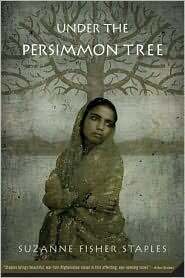 Written in 2005 by journalist Suzanne Fisher Staples, Under the Persimmon Tree tells the story of two people-an Afghani child named Najmah and a United States (U.S.) born woman named Nusrat -and how they become connected at a school in Peshawar, Pakistan. Both characters have dealt with the horrors of war and attempt to deal with the effects of those horrors at the book's end. Since we are all connected on Facebook and Goodreads, I was not surprised when my daughter became aghast that I only gave the book three out of five stars. In her world, the horrors and tribulations experienced by Najmah must have been upsetting. Staples did a fine job at showing children my daughter's age the disgusting effects of war. The three stars I gave the book are my nod to Staples' ability to connect with young readers about war, the cultures of Afghanistan & this particular area of Pakistan, and the religion of Islam. My reluctance to give this book a higher rating comes in with the choice to make Nusrat a U.S. citizen. I am not sure why Staples felt the need to do this. Why was it not enough to make this woman either an Afghan or a Pakistani? Why was it necessary to inject a U.S. presence into a situation that was already (and still is today) made difficult by U.S. bombs and policy? It didn't help my view of the book when Staples forced Nusrat to be some sort of savior to Najmah by offering an ethnocentric U.S. rescue program: Nusrat bringing Najmah back to the U.S. to save her from going back to a devastated homeland. The long arm of U.S. colonialism and greed extends far into many areas of the world. In my opinion, this book would have done just fine telling this important story without making Nusrat a sort of U.S. savior figure. It would be nice for a change to have our children read stories and histories that are not tainted by the pro-U.S. agenda. Wouldn't it be something for schools to allow our children to consider, just for a moment, other ways to live, govern, and believe that are not based solely on the notion that the U.S. model is the only viable solution? The book's ending did have a redeeming quality because it did not tie up everything into a neat and artificial package. There are questions that remain unanswered and a philosophical quandary put forth by the author at the very end. I am happy that books like this are being considered by schools and read by the children, my issues notwithstanding.